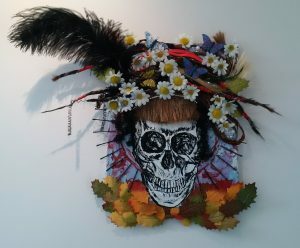 On May 20, 2016 the Wild Heart Gallery hosted the opening night of Honoring the Spectrum of Self, an exhibition where Southwestern College staff, faculty, and students were invited to investigate the sacred pieces that have shaped them as an individual or within the collective. The show featured a variety of works installed within the gallery – including an interactive piece – and presentations on opening night of video, song, and spoken word format. It is our privilege to present the third in a series of blogs which showcase the shared voices of this exhibit that ran thru August 8th. Looking at these two works in tandem, I realize that I am regaining perspective on where I am in this fascinating journey of life. I feel great gratitude for where I come from, the moments I have experienced, and the beings with whom I have had the great privilege to interact. I also recognize how lucky I am to have started my first year of Southwestern College after three devastating deaths – the last of which tore open my heart completely. This year has by no means been easy, though it has been very enriching. For those of you who don’t know, the first year’s curriculum is designed so that we may become extremely aware of who and how we are on incredibly deep levels. Again, not an easy feat, especially with all that comes in the grieving process. I learned – in my first Grief, Trauma, and Renewal Certificate course – that after a loss of a loved one, we often can lose our sense of self. It was, in a way, a relief to have that stated while I was operating through the mire of profound grief. But, how to get back to knowing me while honoring those who have passed? Luckily good self-care has been an emphasis while learning about practical tools in the counseling and art therapy professions. For me, art is incredibly healing and insightful. Creative expression has been an important part of my life and I feel appreciation to have been on the colorful and kooky path of artistry. The encouragement to use and trust art in conjunction with honoring the importance of ritual and ceremony has been an enormous gift from those associated with Southwestern College. 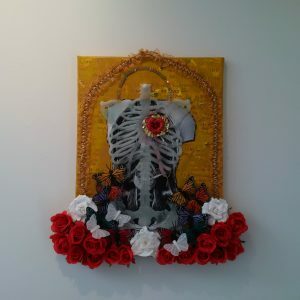 In considering what to make for this exhibition, I found myself tracing my personal history and connection to my hometown of San Antonio, Texas, through layer upon layer of media in these two pieces. Each component in the works is rife with symbolism from a city of pride and celebration, which values its diverse culture and the art associated with the many groups who have inhabited or traveled on from the Hill Country. I can feel my roots being nourished as I reconnect to what formed the core of my person, I find love for the deeply grooved scars which have given me strength, and I am beginning to sense a blossoming anew. I truly trust and believe in the cyclical nature of the universe. With death, will come rebirth.